On a seemingly calm journey to Calcutta, a bus carries Meenakshi Iyer (Konkona Sensharma), a conservative, Tamilian Brahmin and her five-month-old son, Santhanam. Accompanying her is Raja Chaudhary (Rahul Bose), a wildlife photographer who has agreed to assist Mrs. Iyer through her journey. The bus also carries a diverse group of passengers ranging from an annoying, noisy bunch of youngsters, a quiet, old Muslim couple, and two Sikh men among many others. A seemingly peaceful collage of the multiple faces of India, these passengers would have never expected the savagery that was about to let loose. Writer-director Aparna Sen takes her time to introduce her characters through a slow and detailed exposition. Once the passengers are settled into their journey, the peace lasts for all but a couple of minutes. The bus comes to a standstill. A curfew is enforced as communal riots ensue. The locks of the bus door are no use against a frightening and disturbing raid by religious extremists. In these turn of events, fear fosters intolerance among some passengers while Meenakshi´s necessity for help drives her to bury her own unsubstantiated hatred. Master filmmaker Mani Ratnam´s “Bombay” is aruguably one of the finest explorations of human intolerance mounted on screen. While thematically similar, “Mr. and Mrs. Iyer” is “Bombay´s” polar opposite in terms of storytelling. While “Bombay” was an extravagant, epic-scale portrayal of communal hatred, Sen´s film is a simple, microscopic view that is equally chilling and effective. If Ratnam showed the butchering of innocent people, Sen decides not to. Instead she keeps the camera among the “safe” people, and like her characters, allows her audience to imagine the futile brutality that takes place. However, “Mr. 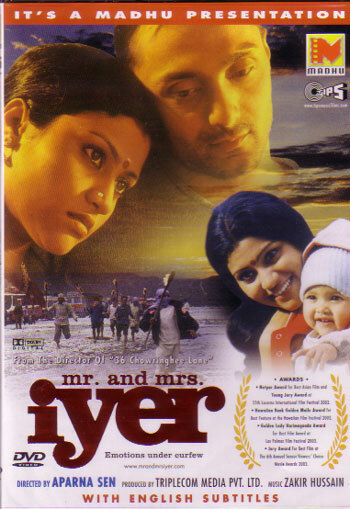 and Mrs. Iyer” is a love story at heart – a restrained, subtle love story where the attraction between the lovers stems not from physical qualities as much as from an understanding for each other´s point of view. Sen imbeds immense affection in her lead characters. Like a mother defining right and wrong to her child, Sen guides her characters to bring them to a comfortable level of human understanding. The contribution of the performers in achieving this result is not be overlooked. Konkona Sensharma´s research and preparation for her role is highly evident. Her diction, her accent, and her mannerisms in portraying a Tamil Brahmin woman are no less than perfect. Her command over the Tamil language is also highly commendable. Meenakshi´s foil, Raja Chaudhary, is consistently played with a sense of buried anger by Rahul Bose. Unlike Sensharma, Bose does his talking through his eyes. The interplay of these conflicting personalities and performance styles results in an impeccable on-screen chemistry. Aparna Sen´s direction is well rounded and her intent clear – to keep it simple and maintain focus on the crux of the story. This is highly evident through Goutam Ghose´s cinematography which is kept raw and simple. There are no fancy camera moves or opulent lighting schemes to distract the style of storytelling. Beautiful songs composed and sung by Zakir Hussain compliment his thrilling score to exaggerate the emotions Sen plays with. The nature of these emotions is often questioned. Are we to sit back and accept them as human or are we to try to change the way people think? These are the questions that foster the seemingly innocent conflicts between Meenakshi and Raja that make this film such a pleasure to watch. Human intolerance in India is a quality often associated with the uneducated or the illiterate. Religious violence is repeatedly branded as the result of politicians using the illiterate to strengthen their own power. “Mr. and Mrs. Iyer” asserts that the problem resides far beyond the aforementioned demographic. That baseless intolerance is also very much a part of the personality of the educated is an ignored fact that stares us in the eye everyday. Aparna Sen´s target audience is clearly an educated, urban one. Through “Mr. and Mrs. Iyer” she sticks a mirror up to their faces and asks them one question – Why?